The VI century Basilica of San Vitale in Ravenna is a unique example of Byzantine art and culture. In recent times an important conservation project has restored the basilica’s mosaic wall decorations to their full glory. Livia Alberti was one of the leaders of the restoration team. Ravenna was still under the reign of the Ostrogoths when Bishop Ecclesius laid the foundations of the Basilica of San Vitale in 527. Incorporating a pre-existing fifth century sacellum (shrine) dedicated to the martyr St. Vitalis, the building took nearly 20 years to complete. By the time Bishop Maximianus had inaugurated and consecrated the basilica in 547, Ravenna was once again under the direct control of Constantinople, following Belisario’s conquest of the city during the course of the Greco-Gothic war (533-553). The Roman emperor in Constantinople, Justinian I, subsequently designated Ravenna as the capital of the Prefecture of Italy – the wall mosaics of San Vitale providing an enduring testament to the splendour of his reign. Over the following four hundred years, the basilica remained pretty much unchanged. However from the 10th to the 18th centuries the church was the property of the Benedictine monastic order and numerous additions and variations to the original structure were put in place, including the building of a cloister and various outbuildings and the raising of the floor. Some of these additions were reversed during the 19th and 20th centuries, restoring the exterior of the basilica to its former austere appearance. In 1996 San Vitale was designated a World Heritage site along with seven other Early Christian churches in Ravenna “by virtue of the supreme artistry of the mosaic art they contain and the crucial evidence that they provide of artistic and religious relationships and contacts at an important period of European history” (UNESCO). The mosaic art in the basilica of San Vitale is concentrated around the presbytery and apse. Mosaic medallions of the twelve apostles plus St Gervasius and St Protasius – the sons of St Vitalis – decorate the grand presbytery arch which is surmounted by the face of Christ, while St Vitalis himself is portrayed receiving the martyr’s crown from the hand of Christ in the large theophany scene which dominates the apse. Here Christ is flanked by Bishop Ecclesius who is offering the Redeemer a model of the church he founded. 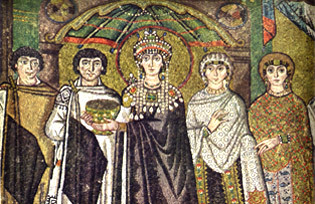 However the most famous mosaic panels are to be found at the foot of the apse side walls – these depict the Emperor Justinian and his retinue on the left and Theodora, his powerful and intelligent concubine/wife with her handmaidens on the right. Portrayed with haloes and set in a background of gold mosaic, these potent images emphasize the position of the emperor and his consort as head of both church and state. 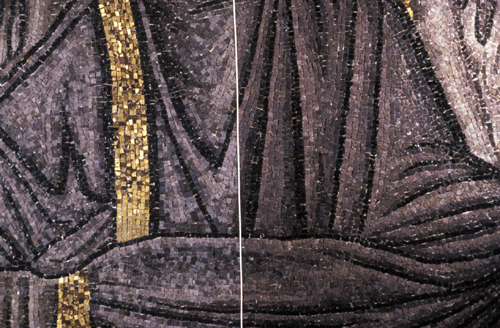 The overall mosaic technique used in San Vitale was unquestionably Byzantine but the work also presents evident individual characteristics – there is nothing like it elsewhere in Italy or even in Istanbul. The master mosaicist at San Vitale would certainly have trained in Byzantium, but his identity remains a mystery (similarly the architect of the church building itself is unknown). There would have been a team of mosaicists all responsible for different tasks: painters to outline the design on the wet mortar, tessera cutters, and most importantly those who conceived the original design and set the tesserae in place. A mosaicist’s hand can be recognized for example by the choice of materials and the color contrasts he uses, and the way he aligns the tesserae. In fact, the different signature styles evident in the mosaics of the apse indicate that there were almost certainly two master mosaicists at work. The tesserae were made from a variety of materials: glass, simple stone or marble, ceramics of different colors and even mother-of-pearl. 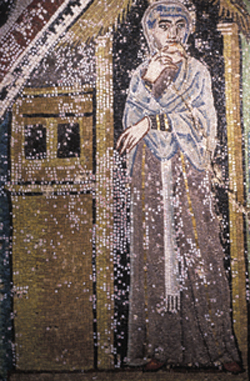 A large number of golden tesserae were used which may have been shipped in from Byzantium. No kiln has ever been found in the area surrounding the church which has led to conjecture that all the tesserae were shipped in. The mosaics certainly would not have been recycled from another church, nor is there any stylistic link with churches of a similar period in Rome for example. Over the centuries, damage to the mosaic wall decoration was caused by a number of factors. The building works, the earthquakes in the 8th and 18th centuries, subsidence due to the rising water table and the consequent increase in damp inside the basilica all had their effect. But some of the restoration techniques that had been used were also the cause of damage. We had to deal with tesserae that had come loose or were lost, or which had become whitened or dull. Sometimes the layers of mortar on which they were set became detached from the brick surface of the walls or vault and fell or drooped perilously. 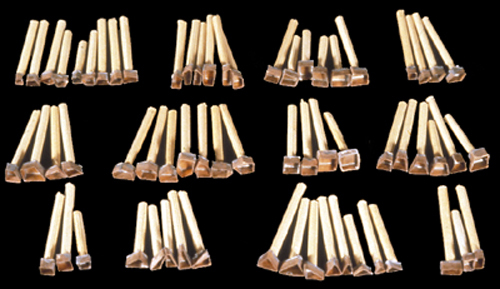 Sometimes the degenerating effects of previous restoration work also needed to be addressed – like the use of different kinds of metal clamps to underpin the detached tessellatum. The very first “restoration” of the mosaics was carried out in the Justinian period just as the initial works were coming to an end. New faces were added as thirty years had passed since the decoration of the church interior had started – for example Justinian’s face had been left empty or remade, perhaps awaiting a portrait to arrive from Constantinople. The faces of the four figures to the right of the Emperor were changed probably to replace portraits of officials who it was no longer important to represent. For the record, Justinian himself never actually set foot in San Vitale. We have no real information on restorations carried out prior to the 14th century, however there is some evidence that tesserae were replaced on the presbytery vault in medieval times. 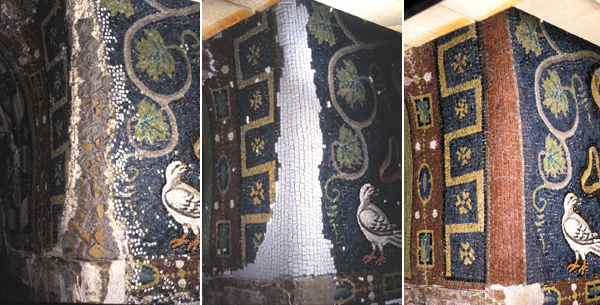 Historically speaking the restoration methods used in San Vitale can broadly be divided into two schools – either pictorial, where the missing tesserae are replaced by an image painted on the plaster filling the lacunae, or full reintegration of the mosaic design using new or recuperated original tesserae. 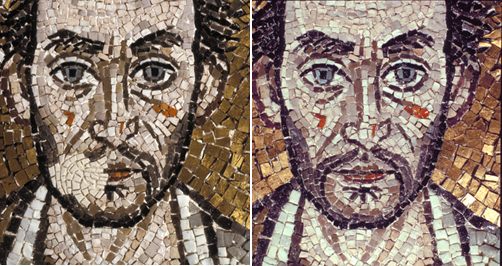 Pictorial restoration involved using either a “fake mosaic” style or a simple painting. One of the most damaging, or invasive, restoration works was carried out in the 1960s when most of the mosaics of the vaults of the presbytery and the apse were removed along with their various layers of bedding mortar. The tesserae were then reset onto a layer of cement applied to the bricks of the vaults. This meant loss of the original color of the mortar support, loss of the original orientation of the tesserae (having been reset uniformly flat) and hence loss of the “primitive gesture” of the original artist. All irreversible changes. Our restoration project began in 1989 following a period of 20 years when no maintenance or conservation had been carried out in San Vitale. As is traditional in Italy, a tender was held for the restoration works with restorers and mosaicists from all over Italy taking part. These kind of tenders – where you offer a percentage below a median price – are always rather a gamble and you need a touch of luck … which indeed this time we had, as our consortium’s bid was declared the winner. The work carried out on the mosaics between 1989 and 1999 by Consorzio Arké was initially funded by the Department of Public Works and then by the Ministry of Culture and Environment Heritage. The director of the project was Dr Cetty Muscolino. The early days of the project were taken up with decisions on how to proceed and what restoration “philosophy” to adopt. At the time in Ravenna there was a strong mosaicist tradition. The general expectation was that we would remove a large part of the mosaics and consolidate them on to a new surface of fresh mortar and also re-make the missing parts with new tesserae. However we were more inclined to intervene in situ, consolidating the mosaics that were in danger of falling by filling in behind the tessellatum and reintegrating the lacunae with different material, which would be both recognizable and reversible. This is a good example of two different approaches to restoration: the full restoration and partial “re-making” of an artifact; or the consolidation and preservation to avoid further deterioration of the said artifact with minimal interference. The difference in the philosophy of restoration in the 1960s and the 1980s is significant. This is when a difference emerged between restorers and conservators. Restorers used to be artisans who were themselves painters or mosaicists, whereas now restorers, or rather conservators, are more like technicians, specializing in a multiplicity of areas, who don’t need to be artists of any kind. Their job is to conserve the work of art in their care. This change in approach was initiated by Cesare Brandi (The theory of restoration, 1963), the head of the Institute of Restoration in Rome, who really started a mini-revolution in restoration. His key principle was that you must retain the ability to recognize an artifact as a work of art – you have to maintain its integrity and authenticity, while at the same time the restoration work too should be recognizable – and reversible. However this philosophy has not been accepted world-wide. Globally there is still some confusion between restorers and conservators. In many countries old-style artisan restorers still predominate. Linguistically too there is confusion over the use of the Italian word “restauro” which can refer to both restoration and conservation. The work started with a pilot project to establish what method of conservation to use. Mosaics are not just a collection of tesserae: the restorer needs to take the whole opus into consideration, including the underlying layers of mortar. The grand presbytery arch was chosen by Soprintendenza as the test area where we would determine the problems that needed to be solved and the techniques that would be used. The CNR (National Research Centre) of Faenza was brought in to help with scientific advice, industrial design and analysis. One of the first steps was to determine which tesserae were loose or not firmly bedded. This we did by touching every single tessera and marking those which needed consolidation with bits of adhesive paper. The detached tesserae were re-bedded with hydraulic mortar and the moving ones were re-adhered by syringing an acrylic resin in behind them, taking care to maintain the original orientation and position of each one. Some damaged tesserae needed to be consolidated before cleaning could begin. 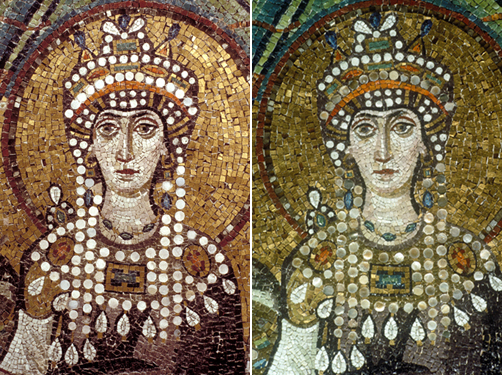 Gold and silver tesserae, whose original protective layer of glass had been lost or damaged, had a protective layer of acrylic resin applied to them first. On the other hand, the damaged glass mosaic tesserae had to be cleaned first in order to facilitate the penetration of the silicate resin used to consolidate them. This product, by closing up all the fractures in the glass, gives a refractory quality to the tessera which is very close to the original and therefore restitutes its colour. To clean the mosaics we used paper pulp compresses soaked in ammonium bicarbonate spread onto ‘Kleenex’ paper tissues. This was done to prevent the paper pulp from going into the interstices between the tesserae which would have been difficult to remove. The compress was left on for periods varying from 15 to 45 minutes and then removed. The mosaics were then rinsed with water using a hand-held spray, taking great care to clean all five sides of each tessera. Any remaining surface deposits that had been resistant to the compress treatment were removed by hand, using scalpels, small chisels and glass fibre pencils. Removing the layers of grime, salt deposits, old mortar repairs and previous pictorial restorations had the revelatory effect of returning the colours of the glass tesserae to their natural brilliance, bringing out the numerous variations in tone and contrast and restoring the beauty and vigour of the images. The ammonium carbonate left no residue on the surface of the mosaics as it dissolved into the air in the form of carbon dioxide, water and ammonia. The next step was the question of how to reintegrate the lacunae which disturbed the visual appreciation of the mosaics. There was much debate before the decision was finally taken to reconstruct the missing parts (the line taken by many of the previous restorers over the years). Our approach aimed at reproducing the irregularities of a three-dimensional mosaic surface which would resolve the visual distraction caused by the lacunae and yet be recognizable at close range and easily reversible – thus fulfilling Brandi’s essential criteria for conservation. To this end we made around eighty tiny copper moulds which reproduced the shapes and sizes of the most common tesserae used in San Vitale. These could then be used to impress the shape of the tesserae into the binder-rich mortar we used to fill the lacunae. The most difficult re-integrations were usually also the biggest. These were only carried out after the completion of a preliminary study which recorded the traces of preparatory painting and indentations in the old bedding mortar – indicative of the number and the alignment of the missing tesserae. The graphics 1 : 1 thus produced were used as a guide for the integration using the copper moulds. The resulting “mosaic surface” was then painted with water-colours and “protected” with a thin coat of resin. The moulding which replaced gold leaf tesserae was also usually treated with water-colours only. However for the chromatic reintegration of the historic panels (Justinian and Theodora) – which are closer to the public view – gold leaf was applied onto the moulded mortar. The CNR in Faenza came up with the design of a ceramic pin to replace the metal cramps which had been used in previous restorations to anchor the mosaics and their bedding mortar to the walls and vault. The natural “affinity” of ceramic to the surrounding mortar, brick and mosaic made them a more appropriate choice for the task. These pins had a very small diameter (8 or 10mm)and a screw-like thread in order to grip better. We used them to consolidate large areas where layers of bedding mortar had become detached from the wall surface. Using a slow-speed electric drill, holes were made in the bricks of the wall into which dense grout was injected. The ceramic pin was then inserted in such a way that its upper extremity would be hidden just under the tesserae. Once these pins were in place and the empty spaces behind the mortar layers grouted, we were able to go ahead with the removal of the metal cramps. Only in the case where their removal would have caused damage to the mosaics around them, did we leave the cramps in place, treating them with a protective layer of acrylic resin to stabilize them. The methods and materials we decided on during the first year remained substantially unchanged throughout the ten years of the restoration work. Where changes occurred in treatment methods, it was generally in line with a change in conservation trends, moving towards minimum intervention and the use of inorganic materials. For example in painting the moulded mortar, we later used fresco techniques to avoid having to use the protective coating of acrylic resin. This was a major restoration project and one would expect its effects to last between 30-40 years with maybe just an occasional bit of maintenance. 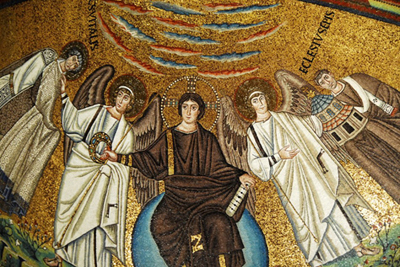 However the work on the mosaics of San Vitale is not complete. The vault of the presbytery has yet to be studied and conserved. *The images belong to the photographic archive of the Sovrintendenza per i Beni Architettonici e Paesaggistici per le province di Ravenna , Ferrara, Forlì-Cesena e Rimini and were taken by Livia Alberti during the restoration project. Livia Alberti is a graduate of the Institute of Restoration in Rome. She has worked on restoration projects in countries around the Mediterranean including the mosaics in Santa Sofia in Istanbul and wall paintings in the Byzantine church at Mar Musa in Syria. For several years she has collaborated on a project in Tunisia for the Getty Conservation Institute – teaching mosaic restoration methods to local artisans. She is one of the founding members of Consorzio Arké, which has been operating in the field of conservation for more than 25 years.